Whether you’re looking to add a little pizazz to your tree or want a fun craft to do with the kids, glittery (yet inexpensive) DIY ornaments are the perfect solution. 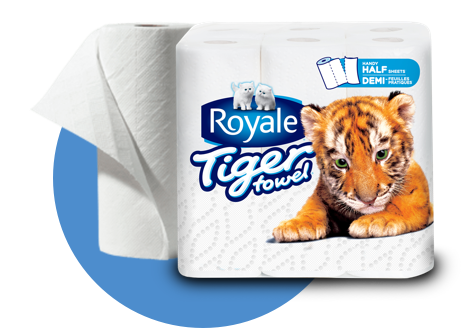 Cut each ROYALE® roll into equal strips about ¾″ wide. Cut a strip in half. Take one half and glue the ends together to create a smaller circle for the center of your ornament (about 1″ in diameter). Tip: For smaller or larger ornaments, adjust the size of your center piece. Create 5 smaller circles (to surround your center circle) by repeating process #2. Place them equal distances apart around your center circle and glue them in place. Take 5 more strips, cut them in half, and wrap them around a pen or marker to curl them ends. Glue the curled strips in place, pairing pieces together to form heart-like shapes. Once the glue dries, completely covers your ornament with spray paint. Once the paint is dry, coat with spray adhesive and sprinkle glitter over the entire ornament until completely covered. Finish up by adding a jewel embellishment to the center circle. Tie fishing line or ribbon to your ornament and hang.